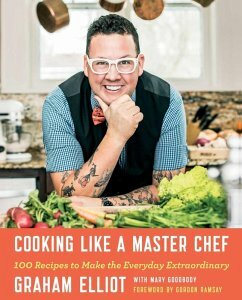 In the first cookbook from Graham Elliot, cohost of the popular Fox series MasterChef and MasterChef Junior, 100 deliciously creative recipes show home cooks the basics of cooking and combining flavors—and then urge them to break the rules and put their own spin on great meals. Graham Elliot wants everyone to cook. To push up their sleeves and get some good food on the table. It's Graham's simple philosophy that, while there is no right or wrong when it comes to creativity in the kitchen, you will benefit from knowing some time-honored methods that enable you to serve tasty meals to your family day after day, week after week. So, to teach you his methods and infuse some fun into the process, he's written Cooking Like a Master Chef, an easygoing, accessible guide for the home cook to create delicious, beautiful food for every occasion. Grouped by season (without being a strictly seasonal cooking book), Graham's 100 recipes are illustrated with gorgeous, full-color photographs and accompanied by simple, straightforward instructions—with great twists for every palate. That's because being a top-notch chef or a talented home cook means being a free thinker, spontaneous, like a jazz musician. Cooks need to change the music every so often—once they're comfortable with the basics—to stay on their toes and infuse their routine with new excitement and energy. Here you'll find recipes for pork chops with root beer BBQ sauce, halibut BLTs, buffalo chicken with Roquefort cream, corn bisque with red pepper jam and lime crema, smoked salmon with a dill schmear and bagel chips, truffled popcorn, and much more. Kids will love whipped yams with roasted turkey, potato gnocchi with brown butter, PBJ beignets, and classic banana splits. It's no wonder so many people love Graham and his energetic creativity in the kitchen. With Cooking Like a Master Chef, now you can learn to be a skilled, resourceful, and endlessly inventive cook who makes food everyone, adults and kids alike, will absolutely relish.